A single plan has been launched for Britain’s railways that will see train and freight operators, Network Rail and their supply chains working together to improve the UK’s rail network. According to Paul Plummer, chief executive of the Rail Delivery Group, the nation will witness ‘unprecedented improvements in the railway’ with more trains, better services and improved stations during the next 18 months. To deliver this ‘once-in-a-generation opportunity’ a four-point plan has been drawn up that outlines four commitments to delivering an improved rail service, including a pledge to strengthen the railway’s contribution to the economy, increase customer satisfaction, and create more jobs. 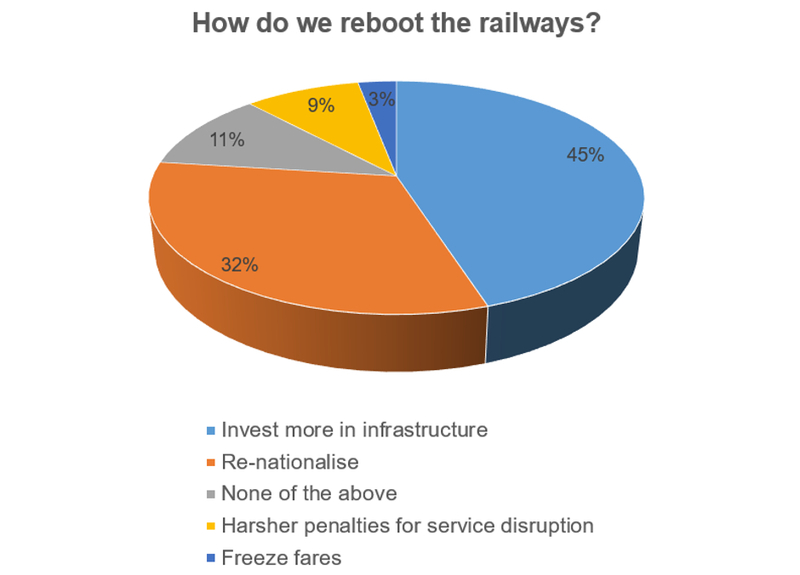 For our poll, we asked what could be done to give Britain’s rail network a reboot and nearly half (45 per cent) of the 390 respondents agreed that there must be more investment in infrastructure. Just under a third of respondents echoed sentiments at RMT, agreeing that the railways should be re-nationalised, whilst nine per cent took the view that that should be harsher penalties for service disruption. Of the remaining 14 per cent, three per cent thought a fare freeze would help re-boot the railways, whilst 11 per cent chose the None of the above option. What do you think? Let us know using Comments below. The debate that followed addressed a range of issues including ticket pricing, driverless trains, government reluctance to invest in infrastructure, and HS2. Touching on infrastructure and addressing HS2, Steve said: “The reality is that no government will take the hard decisions about railways. China can build a bullet train service running at 300mph by laying dead straight tracks of suitable gauge and very few stops. Anything in the way gets not just demolished but rebuilt as close to its original location as possible. That is what HS2 should be. The reality of HS2 is too many bends, too many stops, poor planning and a real speed of 125mph if we are lucky. And yes, driverless trains if possible and safe. The RMT can keep the local services and run them into bankruptcy – why not give the network over to them wholesale. As a form of public transport the train is dying, very few people will abandon their car to go by train. Inner city transport still works (Metro, tube trams) but for long journeys the train is not a viable option, unless it is a very popular route. However, it’s not all doom and gloom, freight transport does work because here time and cancellations are not an issue. I like the train, I don’t want to see its demise but poor service, time keeping, dirty trains, poorly maintained infrastructure etc. too much time and money will be required to bring them up to date. The money is there but the powers that be want to spend it on a white elephant called HS2. On the contrary, the age of the train is just dawning. HS2 will fulfil its destiny when it is linked through primarily to HS1 and the Channel Tunnel rather than the London terminal. Then the main traffic will be substitution of short haul air traffic by railway stock operating on electric power supply. The free bonus will be liberated landing slots up and down the country that become available for additional long haul air traffic. This delays need for an additional runway at LHR/GTW. The follow on infrastructure should then be more bores of Chunnel and a completely new UK airport. The solution to the rail problems is driverless trains. The mistake was not to mothball the Great Central in the 1960’s. HS2 will be using parts of that line now but at considerable cost. Downgrade HS2 to 125 mph and serve more stops on the way. Then more people will be able to access it, not just a few highly paid folks in the cities. By taking the fast non-stopping trains off the WCML, HS2 will enable frequent semi-fast trains on the WCML, in exactly the way you suggest HS2 be operated. The concept of an autonomous car is accepted without much thought. (Use of lane as opposed to line is deliberate to emphasise the similarity). “Driver” only operation. The reality is that no government will take the hard decisions about railways. China can build a bullet train service running at 300mph by laying dead straight tracks of suitable gauge and very few stops. Anything in the way gets not just demolished but rebuilt as close to its original location as possible. That is what HS2 should be. The reality of HS2 is too many bends, too many stops, poor planning and a real speed of 125mph if we are lucky. And yes, driverless trains if possible and safe. The RMT can keep the local services and run them into bankruptcy – why not give the network over to them wholesale. Someone remind me: by whom and when was the fully integrated and owned by the State railway system split up into so many sections and entities that it took a sum equal to the annual maintenance budget (x3!) to pay for the financial and legal fees required to split up something which almost by definition must operate as a single entity? Might it be the same grouping who sold off much of the rest of the Nation’s utility assets: and as with the railways (as seen above!) are now a series of severely ‘plucked’ chickens coming home to roost! These activities were supposed to improve efficiency by the pressures of the market-place. Did they? HS2 is an utter disaster – a white elephant of epic proportions. Backed only by a tiny handful of determined ‘experts’ led by ‘Lord’ Adonis, and supported by the weak ‘Munich 1938’ group of managers (transport secretary Grayling and John Armitt, he of the cheap 2012 stadium build – now being totally re-built), it will stunt UK’s economic progress and transport budget for a generation. If first class was removed from Virgin there would be no ‘capacity’ problem, the only remaining excuse for building HS2.. I would like to think that the infrastructure would be the best option but, even when nationalised, the railway regarded it as basically inter-city and THEIR infrastructure; not something to benefit the country – hence the sweeping cuts by especially Barbara Castle and Dr Beeching. Despite what the Partnership people (Plummer) say it is not benefiting my locals – mainly London based; there are large areas without the opportunity – even for freight – who would benefit from PROPER investment – in affordable and accessible infrastructure (Cf HS2). So a qualified agreement with Mr Cash – with the proviso that there is appreciation that the rest of the country could benefit from a train travel infrastructure – which would most likely reduced congestion – from a more sophisticated and connected network. — Perhaps the re-introduction of parliamentary trains could boost localism – and interest in the railway executives serving the many (businesses as well as people)? 1) High speed trains for large city stations not stopping at small stations traveling away from platforms when passing by small stations that is traveling on center lanes or tracks. This is for safety of people standing on small stations waiting for trains. Because high speed moving train generates immense air suction. 2) High speed trains stopping at all stations. Conservative governments do NOT invest in infrastructure, they always opt to let private investors pay for that and they of course want to see a return for their money, at the smallest expense to them. Never mind slightly faster trains for London-fixated Politicians. Try travelling West to East through Birmingham to EastAnglia or mid Wales. These areas have been utterly ignored by politicians and London fixated civil servants. Fix this sort of poor service FIRST, and that means infrastructure. Ken is entirely correct. The train will disappear: quite simply because it will become an anachronism. Why do we need tracks now we can have automated steering? Why do we need heavy rolling stock designed to pull a line of similar units in a ‘train’? Why do all passengers have to endure stops at other stations enroute to their destinations? And perhaps worst of all, why does all the traffic have to be speed limited by the unit in front, with no passing facilities? This is not as rant for roads. What we need is, as Ken says, ‘lines’ – where non-rail transport units can follow fixed routes and with scope for ‘overtaking’; much, much smaller units that can take passengers direct to their destination, so that every trip is on an ‘express’ and many more of these smaller units, allowing greater frequency of services. It’s high time we started planning the end of the ‘age of the train’. what more cars, noise, pollution? a train pulls the worth of 40 + cars -and- releases time of 40 drivers for the actual routes..
live/love close, use car (and everything else) less (and trains less – yes it is a market solution). bikes -yikes! what a solution! flexible bike-hire and responsible public/engineers/politicians/business. and while we are at it less frivolous business “activity”. grow some of your own, etc. Ultra-insulate homes, save money on gas – dump the gas heating.. The railways have been ill served by politicians and the industry itself for decades. It has become fat dumb and happy and treated passengers and freight customers as an inconvenience. The rail sector has lost touch with markets it could service including freight at shorter sector distances than the 300km mantra always suggests. It became enamoured of big slow heavy trains only to find HMG shot them in the back by closing coal fired power plants. The rail sector believes it can just walk into markets on the basis of being a “good thing”. Its prevailing commercial(? ), operating and technical model is not relevant for high value time sensitive logistics traffic which brings with it imperatives rail does not even recognise. The sector is excessively regulated by comparison with road transport. 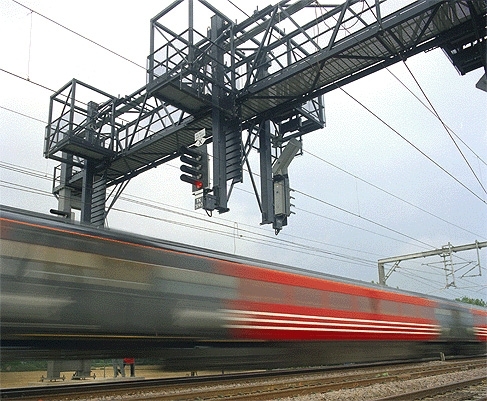 The rail sector can be meddled with by the DfT , ORR, RSSB and Network Rail but these agencies bear none of the responsibility for selling services into a very competitive market. Perhaps they should be seconded to do so. The superstructure is excessive and will capsize the sector. It needs to be simplified and driven by commercial imperatives. Recent failures by the DfT/Network Rail in relation to electrification need to be clearly pointed out. This has compromised other sound electrification schemes but the DfT sems to believe in hydrogen, fuel cells and other exotics. The Sof S believes diesel trains are “better” than electrification. His grasp of physics and traction technology and economics is patently flawed as is that of his advisors and civil servants. Perhaps stopping HS2 and using the money for more practical options to wire up much more of the network for freight and passenger operations would be a scheme yielding greater value for money. and “a very competitive market” so we know where he is coming from. locked in. why not get rid of some of the just-in-time traffic. the privatisation epic was kicked off by Daily Mail’s headline “£100 million loss by British Rail..” and govt fell for it – to kick unions.. i’d be happy to meet govt and unions to help sensible way forward.. and like climate – some non-tax revenue adjustments. Rail has an almost zero presence in this market largely due to a high cost base and poor asset utilization so that torpedoes the comment about getting out of JIT dominated traffic. Revenue share by mode is never mentioned in official stats these days. The loss of coal blew a huge hole in rail freight’s revenue and profits. It had become excessively dependent on large trains moving at relatively slow speed (this includes containers). What does it replace the lost coal traffic with? The biggest target market for is the inter-urban freight and logistics sector which is virtually monopolised by road transport based on cost, agility, responsiveness and a lot more. Unless and until rail can match road transport on these and other measures it will be trailing the more agile and commercially focused road operators. Assuming rail can just secure share is a fallacy. It cannot rely on the discomfiture of road transport on emissions, congestion and driver shortages. If it is to participate on a sustained basis in freight then it needs to fundamentally change its product and service offer. Renationalise, invest in infrastructure, freeze fares and fine poor performance. Oh yeah, and remove the unions and cancel HS2. Concrete over the tracks and make them bus and truck only. Thereby increasing capacity on the roads. This was something advocated in the 1950s and 60s. It was attempted as a project in Norfolk and proved massively expensive and complex. A non-starter particularly in view of the absolute dependency of road transport on liquid hydrocarbons despite all of the noise about electric and autonomous road vehicles. Making rail more efficient, cost competitive and attractive to end users might be a more useful start point. We should not ‘freeze’ fares, we should tear up the fares manual and start again, with reasonably-priced single-leg tickets, to enable us to mix and match Peak, Off Peak and Advance products as suit us. It would help to start with mileage-related pricing with an Off Peak Single product costing half what an Off PEak Day Return does now. Any elevation from this would have to be justified with some evidence of product quality, such as catering or high end-to-end speed. The golden age of train may well be long gone, smoke billowing out of the steam locomotive, yes I remember it well. However with environmental pressures aplenty the age of steam is dead. Can ‘we’ usher in a new golden age of train? yes if the will is there. Infrastructure is a key part as is the rolling stock, make it pleasurable to go by train (and cheap enough) people will want to travel by train. Sounds simple doesn’t it so why can’t the fat cat privateers just ease back on their profit, make the trains more useable and let the public vote with its feet. less need for money (more intelligent use) = less need for work, less transport all round, fewer “things”, more emphasis on quality. outlaw built-to-fail.. release time, enjoy the scenery. UK not really in need much of HS.. end of the EU rail lines..it is just a fashion thing to show we can do it.. the Unions do need to get this: the WEst got overblown on credit money and must come down – Banks, UBS included – see recent news items. Engineers ! GET INVOLVED.. This may have been said already. Instead of throwing countless millions at HS2 would the money not be better spent on upgrading the loading gauge of trunk routes to handle trains full of lorries? It seems senseless to put trucks on trains in Calais then take them off again in Dover so they can clog up the M20, M25, M1, etc, etc. Through trains to provisional distribution hubs could save masses of road space (so we can keep hard shoulders on motorways – don’t get me started on that one!) Also what happened to container trains, Freightliner I think they were called, does that network still exist? There are a number of projects that have exactly this sort of concept in mind. Trains able to carry full sized tri-axle semi trailers without compromising the loading gauge on routes from the CT to London, Birmingham, Liverpool and Manchester and then to Glasgow and from London to the East Midlands, South and West Yorkshire, Tees and Tyneside look feasible. Extensions to the South West and Wales could follow. The trailers need to be what the hauliers and shippers want (full sized) and not at the dictate of the railway civil engineers. Previous piggyback operations used bespoke kit which was not favoured by the wider trucking sector. Fast frequent services on a turn up and go basis would be a useful start point. Domestic traffic in containers was always compromised by the need for terminal lifting and the limited volumetric capacity of ISO type boxes. I’m all for this concept but I am concerned about any proposal that says “just upgrade…”. We are all engineers and we all know beyond certainty that “Upgrade” means twice the cost and three times the duration of new build. We need HS2 and we need new freight services. Only then can we really tackle the core issue of the existing trainset that is 19th Century and no longer fit for purpose. With sufficient redundancy generated in the existing system by new services running along side, we have a hope of re-engineering the Victorian asset for the 22nd century. The cost of rail travel is not surprising given the culture and habits of national rail. I was flabergasted and amused by the recent renovation of our local station. Pride of place went to the break room. The work took ages, the footbridge is lit so that it can be seen from space, I get retina damage just crossing it. Massive cable conduits exist unused. The foundations would support a battleship. All built to railway standards no doubt. It would have cost many times more than necessary or appropriate. How do you start to reform an industry like that? You can just imagine what you would be up against. HS2 should not even be contemplated unless a proper cost/benefit can be done. And not one that quotes the average fuel consumption of a car in 2030 as 30mpg!